Nursery, Pre-Prep, Prep, Senior School – at Clayesmore their philosophy takes into account the long game. Co-educational, for ages 2-18 in the most to-die-for surroundings, Clayesmore is a school with a real family feel. No wonder it is so popular! 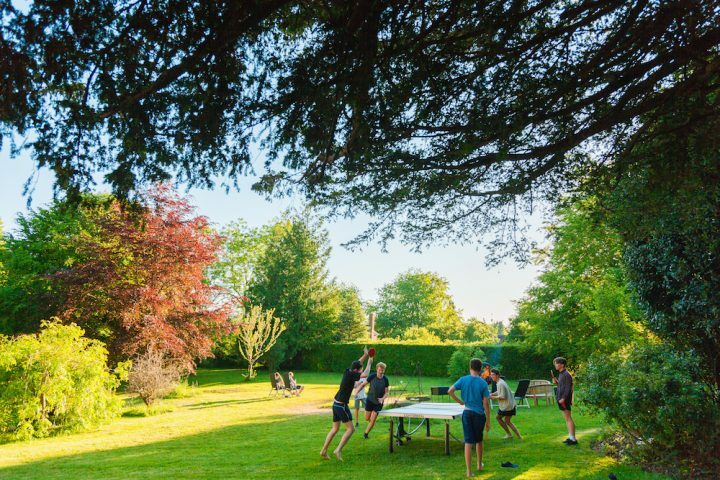 Tucked neatly between Blandford Forum and Shaftesbury, Clayesmore Prep nestles close (but not too close) to its attractive big sister, the Senior and Sixth, and its 210 pupils enjoy acres and acres of utterly stunning, bucolic countryside. Oh, and there’s a few playing fields there too. Founded in 1896, the school was originally sited in Middlesex before moving to Pangbourne and then onto Winchester, finally settling down in Iwerne Minster for the summer term of 1933. The Prep School, formerly Charlton Marshall School, joined the Seniors on site in 1974 and brought with it great change, as the following year the school became co-educational. 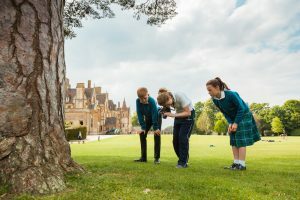 While the Senior School enjoys the hallowed halls and turreted grandeur of an impressive mansion designed by architect Alfred Waterhouse of Natural History Museum fame, the Prep School by no means feels like an add-on. 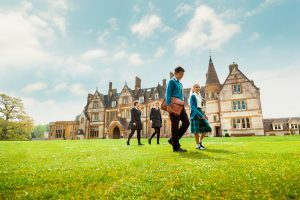 In the wonderful Thai saying ‘same same but different’, the Prep has its own uniform, own buildings, even its own sports pitches, but also enjoy all of the benefits of being part of an all-through school. Able to roam free (within reason!) these kids get a strong academic prep school eduction, while the small pupil numbers maintain the feel of a friendly family home. 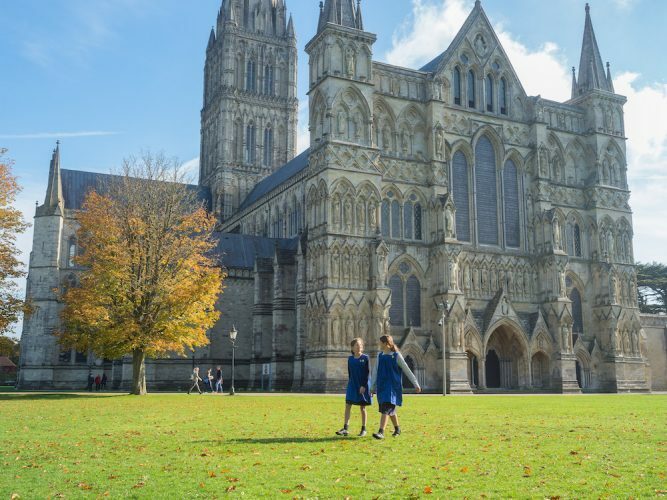 Pupils come from a wide area,from boarders with parents posted overseas, to those who live nearby in Salisbury, Dorchester and Blandford. The school is so popular that buses bring in children from as far as Bournemouth and Poole. In a word, impressive. 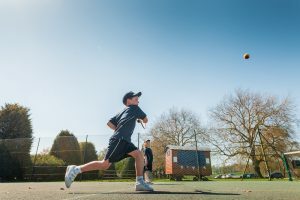 With no squeeze on space the Prep have their own (pretty massive) playing fields, an adventure playground, manicured gardens, separate Pre-Prep playground, woodland and Forest School, and they also get to use the Senior School’s astro pitches, tennis courts and swimming pool. The Prep school buildings are being refurbished bit by bit as we speak, but the yet-to-be-touched departments don’t feel scruffy. A big tick goes to the Prep’s very own dance studio, the only purpose-built dance studio I’ve seen at a Prep School. It’s so popular that the big kids dash down here to use it at every opportunity! Sport is taken very seriously and the results bear that out, with the Boys’ U13 team as county cricket winners, the girls as current North Dorset hockey champions and the school boasting Hampshire player Lewis McManus as an old boy. 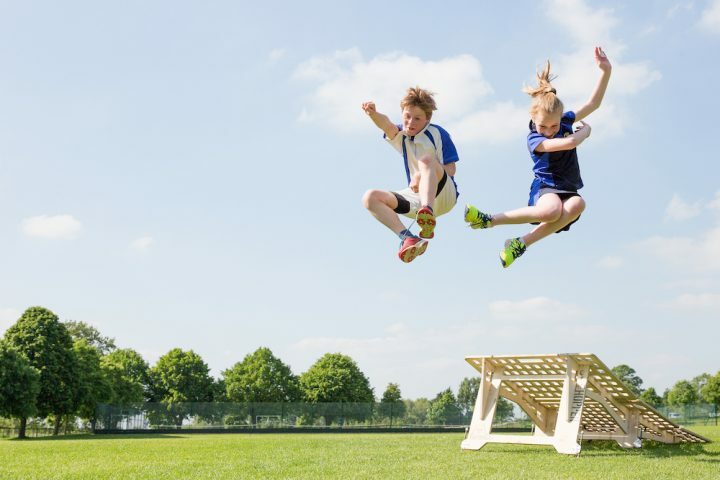 Having said that, their sporting philosophy is healthy – that prep school sport is not all about finding the next great professional sportsman but about building up the positive experience of sport for life, to encourage a love of it that will continue into adulthood. All kids have a go and the school makes sure that even the most reluctant player plays in a minimum of 6 competitive matches per term. Drama is a biggie here, with the theatre (an impressive 180 seater) hosting two major drama productions a year. There is a Glee Club, Drama and LAMDA on offer too, amongst a myriad of dance disciplines. The art room is large and bright, the children clearly inspired by their Head of Art, a very successful fabric designer in her own right, and DT is right up there too, also with a new refurb to the suite. The Head of DT is an incredible forward-thinker, getting the kids stuck into laser cutting and 3d printing – constantly looking towards GCSE DT rather than fiddling around with blocks of wood. For the musically minded, there is a Brass Group, Chamber Choir, Strings Group, Rock Band, Orchestra, Guitar Group, Choir, Dragon Drummers….shall I go on? Like the senior school, Clayesmore Prep is not an exam-passing factory (the intake is totally non-selective), though there’s a strong success rate for pupils all the way through. The Pre-Prep is small and cosy, located in its own wooded area. Moving into a separate building for the Prep, a bright new block built in 2008, there is one form for each of Years 3 and 4 with no more than 18 in each class, and once you hit Years 5 and 6 an extra intake of children allows for 2 forms in each year. In Years 7 and 8 there are three classes per year. The lessons I poked my head into seemed fun and interactive, with a strong focus on forward thinking education and an embrace of mobile technology. Clayesmore very much has the feel of an all-rounder school, with children doing extremely well in all disciplines – this year 21 scholarships were won across Academic, Drama, Music, Art and Sport into senior schools. With only the occasional pupil leaving at 11 to go to the excellent local grammar schools, nearly 90% of all Clayesmore Prep children go onto the Senior School. While this is by no means pushed, it is a clear indication of how parents feel about the school, and bigger nearby public schools are clearly being shunned in favour of the ethos at Clayesmore. Unsurprisingly, boarding is hugely popular in this rural idyll, with more fun activities than you can shake a stick at. 50% of children in Years 7 and 8 board, with 25% of children in Years 5 and 6 and a scattering of boarders in Years 3 and 4. Boarding is full or flexi (you have to commit to 2 or 3 regular nights, ad-hoc B&B nights are not an option) and although many boarders go home on Saturday nights there are a strong contingent – at least 30 kids – who stay in to enjoy the whopping selection of weekend activities, including ringo-ing, dry ski slope skiing, sailing and horse riding, and a whole range of activities in school from cookery to gardening to wildlife hunting. 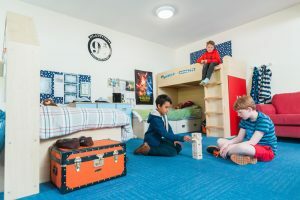 Most boarders are UK based – the school is so popular that they don’t need to seek out overseas boarders – and the fun stuff takes place in a bright, light boarding block. From the outside the mid-70s building isn’t much to look at but the school have worked their magic inside, with funky artwork, colourful sofas and some very impressive bunk bed/desk/sofa combo units being rolled out throughout the dorms giving the boarding house a fun, cosy feel. 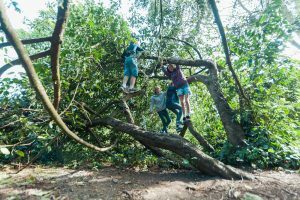 In the head’s words, there are ‘very few places you can hide away’ at Clayesmore Prep. The smallest Clayesmorians delight in a warm, happy and nurturing atmosphere in their own gorgeous corner of the campus. If you fancy your little one exploring nature, swimming, dancing, enjoying yoga, searching for creatures in the woods, pond dipping in the lake or just playing on the pirate ship or in the enchanted garden (along with all the essential phonics and pre-school learning, of course) this is the place for you. The maximum session size is 16 and many children stay on for the Pre-Prep. We were particularly impressed by the working relationship between Prep and Senior School. 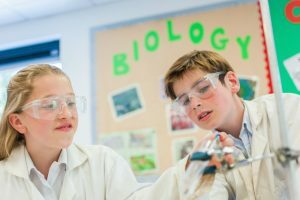 Not only are the younger children able to use any and all of the impressive facilities of their older siblings, but there is a strong programme of Senior School pupils helping in the Prep School, whether it is reading with them, helping out in the nursery as part of their Duke of Edinburgh schemes, or BTEC Sports students coaching the Prep sports teams. 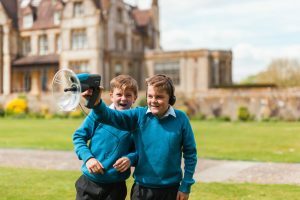 Whether it is waving to a sibling across the dining room or playing together outside, the school seems happily linked from tinies to sixth formers. 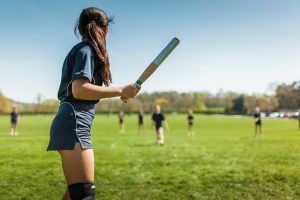 We love the sound of Year 7 and 8’s Thursday afternoon schedule – they get the run of the Senior School facilities when their older cohorts are out playing matches. Throughout these two years, each pupil gets a whole term of DT, cookery, photography, pottery, print making, textiles and more, enabling them to get a real taste of life in the Senior School and making the transition at the end of Year 8 smooth. 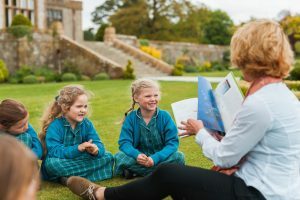 Pupils can come in for breakfast with the big kids at 7.30am, and the Nursery and Pre-Prep are open from 8am until 6pm, so there is supper available for even the youngest years. Pupils of all ages can stay for supper and prep with the boarders until bed time. Working parents, this one is for you! 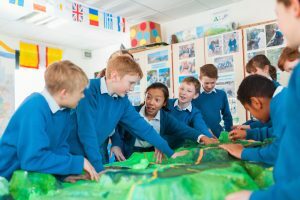 What must be noted is that Clayesmore oozes with forward-thinking vision – they clearly intend to (and do) lead the way with dynamic and innovative approaches to teaching, which turns out children with confidence, compassion and ambition. They are focused on developing the individual (yes, I know we hear this from every school, but it is obviously true here) and help them to become people who will make a real contribution to their world. They are proud of their happy community of staff, parents and pupils and it was clear from my visit that Clayesmore Prep is a fantastic environment to just be a child in. 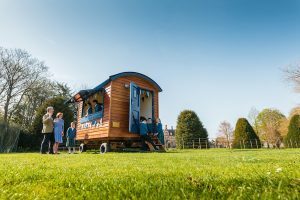 There are some lovely trips on offer, including a fab Year 8 post-Common Entrance trip to Cornwall, adventure trips for Years 4 and 5, an annual French and History trip to Normandy for Year 7 and loads of jaunts to more local places such as the Jurassic coast, Stonehenge and even the local brewery! The Prep has an outstanding Teaching and Learning Centre, which encompasses an impressive More Able and Enrichment (GAT to you and me) programme too. A team of specialist teachers work with children both in the classroom and in one-to-one sessions, and the department is based in a suite of bright, colourful rooms bang in the middle of the busiest corridor so there is no stigma felt by children attending. I felt the team here were incredibly impressive – they have clearly recognised the growing number of children experiencing dyslexia, dyscalculia and other issues and are tackling them with gusto and bravery. Fees start at £2570 per term for the Pre-Prep, rising to £4,410 per term for Year 3, £4,750 per term for Year 4, and £6250 per term for Years 5-8. Boarding fees are £5890 per term (Year 3) or £8370 for Years 4-8. Parents love the strong family feel of the school. ‘Clayesmore is in a different league,’ one parent told me, ‘everything from the school itself and what goes on inside, to the teaching and support staff. The consistent dedication, commitment and one to one interest shown by them all is wonderful.’ I probably don’t need to say anything more, do I? Good for: Those looking for a co-ed rural school with plenty of activities and roaming room for the kids. Sport and music are both strong here, as are art and DT. A school that will do well by all kids whether they be super bright, sporty, or those who need a tad more attention. The all-through school environment with a strong, warm family feel is exceptional. Not for: Parents who want a selective hot-housey approach to schooling. Dare to disagree?! Be my guest! Their next Open Morning is Saturday 2 March but if you can’t wait that long (I wouldn’t!) please call Margaret on 01747 812122 or email admissions@clayesmore.com. Want to know more about the Senior School? Check out our Muddy review here.